Rayman’s return to gaming took an unusual path through a land of Rabbids before finally making his way back to his traditional platform genre with the rather excellent Rayman Origins. Legends continues Origin’s successful structure with a few additions of its own, but can it recapture the magic? In an unsurprising move, Ubisoft’s sequel to Origins doesn’t try anything overly new, but it does refine the gameplay and graphics of the first game to create an arguably better experience, while extending the play time with a mix of old and new levels and bonuses. As before, the game boils down to running from left to right and occasionally climbing up and down, collecting Lums (little flies that make up the currency in the game) and saving Teenies hidden throughout the level. Save all the teenies and you get a gold trophy, but even saving a few will allow you to open up new levels in a similar way to Mario 64′s coin system. Enemies and obstacles become more and more threatening throughout the game with a much more balanced difficulty level when compared to Origins. At first, progression is quite fast and unlocking new areas is fairly straight forward, but the game starts to add new enemies and ramps up the difficulty as you open new areas and sets of levels. Having now played the game through on Wii U and having had a few hours with the PS3 version, it’s clear where the game originated. The Wii U version uses the gamepad screen to great effect, introducing Murfy as a playable character who can be controlled via the touchscreen by a second player or a single player, though the latter is certainly more entertaining. Only later in the development did Ubisoft Montpellier make this a cross platform game and I was concerned just how well the Murfy sections would translate to a standard gamepad, especially where you need to complete several actions at once during speedruns. It turns out that my fears were unwarranted, the developers have done a great job ensuring that Murfy is just as playable on the controller, even if it does mean taking a little control away from the fly. 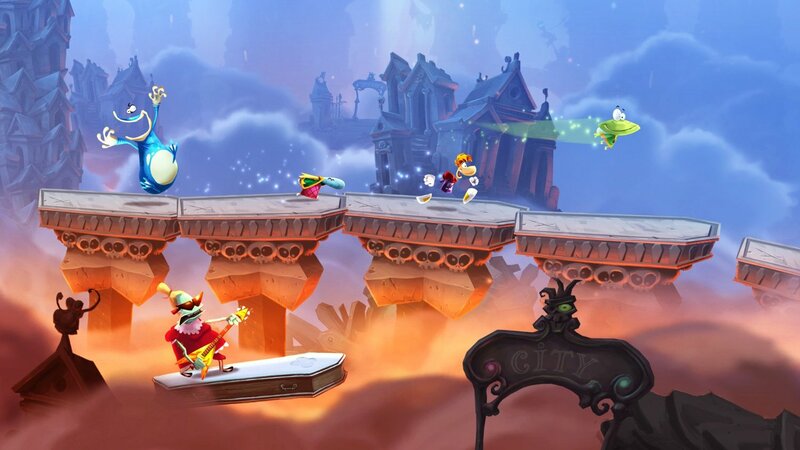 Rayman Legends is a big game. In addition to the standard levels there are remixed versions of the original Rayman Origins game to unlock via lucky scratch cards, a multiplayer football game set on a 2D plain and plenty of characters. There is also a daily challenge which can take the form of a speedrun, timed Lum collecting or endless runner style distance challenge. These offer awards for those able to beat the average time in Gold, Silver or Bronze. Because this is a world-wide competition, the bounderies change throughout the day and a time you set in the morning to get gold may only gain you a silver by the end of the day. It’s a great addition that really adds some longevity to the game. The art style is just as beautiful as in Origins, maybe even more so as new areas show off some of the fantastic multi-layer detail and wonderful hand-drawn levels. This 2D game beats many 3D titles in awe-striking beauty, it really is that good. 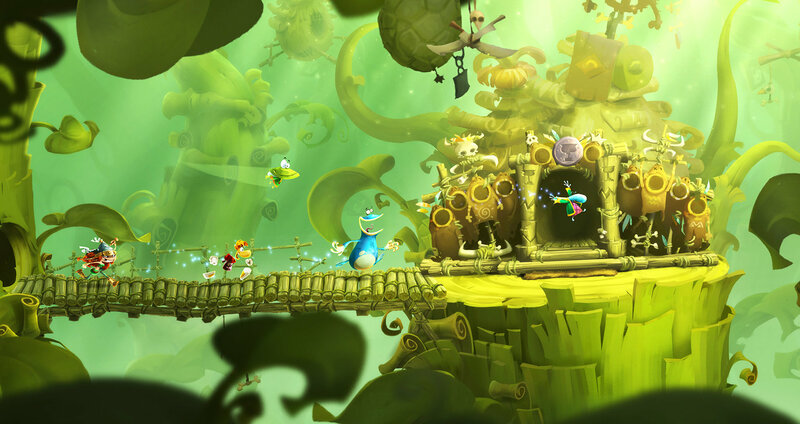 At worst, Rayman Legends is on a par with the original game, but the extra modes, unlockable Origins levels and new environments raise it above even those lofty heights. Playing it on 2 systems is never a chore and I can’t wait for the portable Vita version.